The Melbourne 2015 Home & Giving + Fashion Fair offers a sea of choices for visitors, so how will you differentiate yourself from the stand next door? Here’s 10 Visual Merchandising Tips for a fabulous exhibition stand or retail space from Visual Merchandiser Natalie Coulter, founder of Belle Flanuer. The shopping experience has to be a treat! Whether the customer is wandering through your exhibitor stand or is in your retail space, 46% of customers will buy from a retailer who personalises the shopping experience. Therefore the in-store experience is crucial to a successful business and critical to the customer experience. Customers who shop exclusively in-store visit an average of 7.5 times a year vs those who shop online and browse retailers an average of 3 times a year. People shop where they are wanted so help the customer feel connected and welcome! Share yourself, share why you do what you do with the customer. 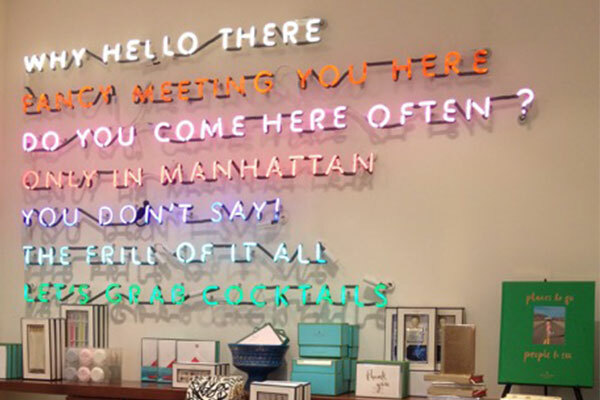 Personalize the shopping experience, you can inspire, connect and inform the customer of your brand philosophy by way of signage, store presentation and display. Know your product and plan the layout of the stand accordingly. Leave a clear line of sight from the front of the space to the back and side to side. Position the merchandise with lower items at the front of stand and taller items towards the back and side walls. Use the space creatively and wisely, direct foot traffic and ensure customers can cover the entire stand/store. Light the back wall and create some drama on it, this will encourage customers to view what’s at the back of store and by doing so check out your products on the way through. Ensure easy accessibility to all products. Group and display items that talk to each other. Think outside of the box for your stand fixtures. Working with products that are hand made or reused can add a level of curiosity, interest and can be cost effective. ‘On trend’ fixtures can also add a freshness to any product. Once you’ve worked out your stand style to suit your product, invest the time and money to get the fixtures right. These same fixtures can be reused time and time again and revamped by wrapping, covering, painting and layering with other materials to give them a fresh look at each fair or event. 64% of retail sales come from ‘eyelines’, so in placing fixtures, understand where the optimum eyeline is and display your hot product at this height. Identify the connecting thread of all of your products, celebrate this thread and incorporate props and quirky pieces that tie back to the product. For example previously at the Sydney 2015, Home & Giving Fair now with FASHION EXPOSED REVIVED, exhibitor Vintage Beach Shack’s showcased vintage fabrics and homewares and they did a very complimentary job in linking props and fixtures with vintage suitcases, rustic window frames and hessian fabric to complete their vintage beach vibe stand. Develop a thread for your display props and fixturing. Start at the window space for a store or the front display point. Link through the space a thread by way of props, texture and display. For instance white painted tree branches might act as a display fixture for bangles and necklaces on front display point, then continued as a prop in display cases and repeated at the back wall as a fixture of sorts for displaying bags, scarves and shoes. Allow for negative space in your stand. Don’t overstock the stand with so much product that the customer can’t feel your vibe. Edit your range. Too much product can be overwhelming for anyone making purchase decisions. Composition is key! Present yourself in the reflection of your product. Wear what you sell and find a way to be your brand. Retail your way! If wearing the product is not possible, choose a colour or style to link to the stand in some way. Be part of the overall composition package. Allow for easy navigation throughout the space. Direct your traffic. Increase the time customers spend at your stand. Place different types, yet complimentary products next to each other to encourage items selling together. Squeeze the value out of your stand cost and imagine yourself as the customer, think through their journey in your stand. Retail is detail! Provoke intrigue and amuse the customer. The store/space signage and the design of any graphics should complement the overall design concept to make a clear statement of the stores identity. Highlight your branding and signage clearly in the space. Tell the story of your product and how it came to be with signage. Be authentic. Get creative, take pride in your stand image and have fun! How your stand looks depends on your planning and efforts. It’s important to think of it as a work in progress. Once you have covered all of the above you can stand back and enjoy your efforts, feeling a sense of accomplishment. As the event unfolds be curious about what’s working best for your stand. What doesn’t work will become obvious and you can tweak and change things up for the next exhibition event. Natalie Coulter is the founder of Belle Flaneur, an initiative which brings together artists, designers and students to collaborate on window displays, visual merchandising and art installations. Natalie also teaches units for the Visual Merchandising department at TAFE Sydney Institute, Australia and has hosted a series of seminars at the recent Sydney 2015, FASHION EXPOSED REVIVED now at Home & Giving Fair. This August, Natalie and the team at Belle Flaneur will be curating ‘The Style Space’ at the Melbourne 2015, Home & Giving + Fashion Fair. Tags: Australian business, Belle Flaneur, creative design, design, exhibition space, feature, Natalie Coulter, Retail Space, style, stylist, visual merchandiser, visual merchandising. Bookmark the permalink. I love this blog, the tips are really helpful for us. Thanks for the helpful tips on setting up merchandise displays! Part of my new job might require me to do something like this, so I’m trying to learn this soon. I like that you suggest identifying the connecting thread of your products to create a theme. I’ll be sure to make everything seem like it has a place.